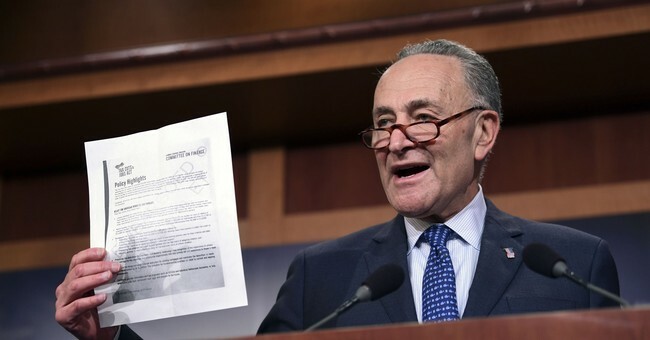 “We’re kicking 13 million people off health insurance to give tax cuts to the wealthy,” Senate Minority Leader Chuck Schumer said of the GOP's plan to dismantle the Obamacare individual mandate in its tax reform plan. "Schumer is using inaccurate language that we have warned Democrats about before," the fact checkers write. First of all, no one is being forced to give up their insurance. By 2025, there would be 5 million fewer people on Medicaid, 5 million fewer people in the exchanges and 3 million fewer people getting health insurance coverage from their employers. That adds up to 13 million, but CBO says the action would be voluntary. In other words, people would not be forced to give up their insurance as Schumer claims. So, Democrats need to work on their interpretation of that CBO report. The second part of Schumer's claim makes a little more sense, the editors write, as the repeal of the mandate is expected to benefit the wealthy. Since wealthy Americans pay most of the income taxes, "it’s natural to expect that they would reap most of the benefits of a broad-based tax cut." They give Schumer the benefit of the doubt on that latter point and leave him with just Two Pinocchios. They weren't so kind a couple weeks ago. This is the second time in recent days that the Washington Post fact checker is calling the Democrats' bluff. Earlier this month, they claimed that the GOP tax reform plan will increase taxes on most middle class families. The WaPo found out that they had taken a few statements out of context to come to that misleading conclusion. "In their haste to condemn the GOP tax plan, Democrats have spread far and wide the false claim that families making less than $86,100 on average will face a hefty tax hike. Actually, it’s the opposite. Most families in that income range would get a tax cut. Any Democrat who spread this claim should delete their tweets and make clear they were in error."